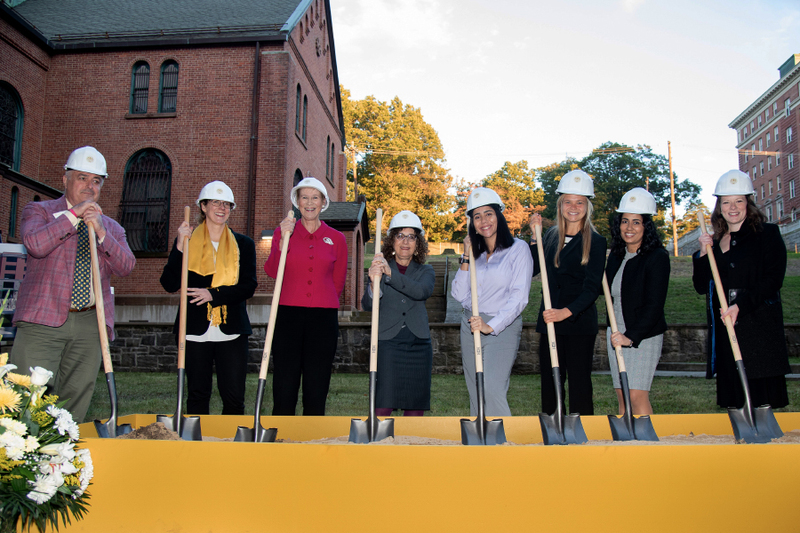 During the 2018 Reunion and Homecoming Weekend, the College held a groundbreaking ceremony for its newest building: a combined residence hall and nursing education facility named in honor of one the Mount’s most illustrious and influential alumnae, Corazon C. Aquino ’53. Maria Corazon “Cory” Cojuangco Aquino served as the 11th President of the Philippines, becoming the first woman to hold that office—and Asia’s first female President. Yet before she entered politics, she was a self-proclaimed “plain housewife,” married to Senator Benigno Aquino, Jr., a staunch critic of President Ferdinand Marcos. After her husband was assassinated, she emerged as a leader of the opposition and wrested the presidency from Marcos’s 21-year rule. Widely recognized as a champion of democracy throughout Asia and a defender of human rights worldwide, Corazon Aquino garnered scores of awards and honors, among them the J. William Fulbright Prize for International Understanding, the Eleanor Roosevelt Award for Human Rights, and Time magazine’s Woman of the Year. She returned to her alma mater over the years—she was celebrated as an honorary degree recipient, Doctor of Humane Letters honoris causa; honored with the Saint Vincent de Paul Award at the annual Scholarship Tribute Dinner; and received the College’s highest honor, the Elizabeth Seton Medal. Excitement about the new project has been swirling around campus. 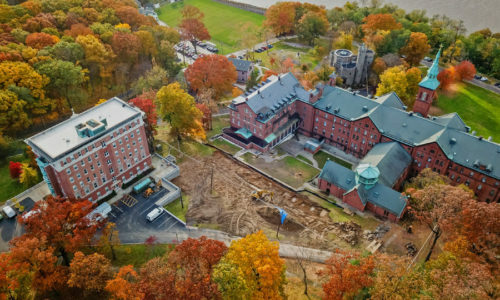 Aquino Hall, a five-story, 56,000 square-foot building, will be situated between Founders Hall and Seton Hall. 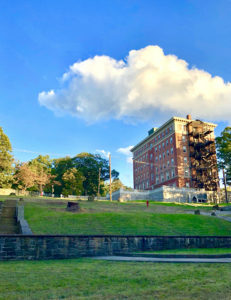 The top three floors will provide housing for 120 students—these will be the first residential additions since the opening of Mastronardi Hall in 2007. Since then, the College’s student population has grown by nearly 20 percent. The lower two floors of Aquino Hall will house technologically advanced nursing simulation laboratories that will support the latest and best practices for training nursing professionals. Nursing remains one of the College’s signature programs and the new simulation laboratories will keep our program strong and at the cutting edge of the profession. Through instructional technologies—including state-of-the-art patient simulators, live-action simulation, and observation areas—the laboratories will allow students to master the essential skills for several nursing specializations: clinical assessment and adult/primary care, as well as pediatric, maternity, and community health nursing. Planning any major construction project requires careful preparation. In recent months, the College has completed all engineering and architectural work, filed necessary permits and site surveys, and obtained approvals from the community board and city planners. The $15.5 million project—the first new construction on campus since the Peter Jay Sharp Athletic and Recreation Center in 2009—is expected to take about 18 months to complete, with a proposed opening in 2020.